I see the July issue of SA4x4 has a DIY article for a battery box. What does this mean to YOU ?? 1) Is it just a mobile unit for the 2nd battery ? OR would it be permanently mounted in YOUR rig ? 2) Must it be able to charge from the alternator ? 3) Do YOU want it to charge from solar as well ? 4) Do YOU expect this to charge from 220V when at home or in a camp with 220V ? 5) Do YOU expect multiple power outputs from such a box ? 6) What else would you want in your ideal battery box ? 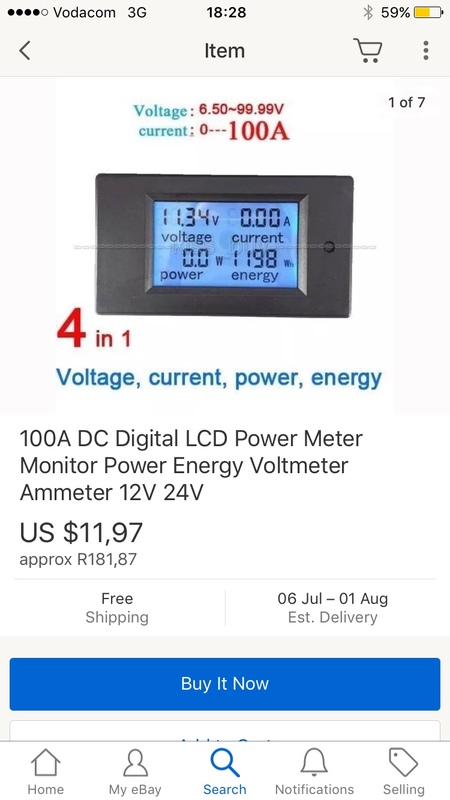 Point nr 5 is a definitely yes.Meters showing the volts,watts,amps etc. would also be very nice. But of course that would increase costs and not everyone would need everything. I would suggest something that is modular where one could add "plugins". Personally I'd like a box to have the battery, a D250S and a Meanwell 12V PSU. That way one could have Solar, alternator or 220V. This box could be portable or fixed; each with it's own pro's & cons depending on how you camp. I used to have the battery "portable", but it is such a schlep to take it (and the fridge) off the bakkie. These days I leave it on the bakkie and just run ripcord to the Gazebo for a 12V down lighter. In the tent I use those round pop-up lanterns with the magnetic base you buy at builders. I think if one makes it removable/portable you could use it in the house as well for load shedding. Stef you raised a point I never even thought off - being capable of removing the battery box at the camp site ... Wonder how many guys goes this route ? Landi is not a brand..
William so what have you seen or heard about that "would be nice" to have in your ideal battery box ? and what would the the "purpose" of yours ? Plugs connections mounted on rear and font bumper- BRAD HARRISONS Etc.. I'm salivating from the time I say this thread in the active topics Chris!! My box sits in the middle of the back seat and acts as an arm rest for my rear seat passengers. When there's load shedding it powers my lounge circuit. I couldn't imagine it being a permanent fixture, though I must figure out some sort of restraint to stop it being a missile if I have a collision. I'm busy upgrading my batt box so I actually went out and bought the July issue of SA4x4, though I'm yet to read it! Can I get back to you soon?! Just read the SA4x4 Article, for what it's worth, rather brief and with inaccuracies né. Couldn't help but think 4x4direct missed a good opportunity there, good job they gave the wrong web address for deltec energy solutions hey! Interesting that they mounted everything on the box's lid, I didn't think of that and I'm using the Saam box. as they say: "Watch this space"
So what have we learnt from this thread so far ? - some need thick wires to the back to be able to run heavy stuff at the back OR to use the second battery as a starting battery in an emergency ... certainly possible, but not a standard function in an off the shelf battery box. - monitoring .. ooooo this is a can of worms with LOTS of options !!! Skip the whole intelligent solenoid setup; run your thick cables to the rear with a DC-DC at your batt box. Then have a CH solenoid to "bypass" the charger & connect the 2nd batt directly to the primary for jump starting/winching. For added safety to protect the DC-DC charger one could wire an additional relay to disconnect the charger output from the 2nd batt. This is where the controllers/chargers with the extra remote enable lead could come in handy....one would not need the extra relay.